WHY DOES RUST CHECK BEAT ALL OTHER PRODUCTS ON THE MARKET? Unlike conventional oil, tar and wax-based products, which do little more than just cover up the metal in your vehicle, Rust Check creeps into all hidden rust prone areas including doors, fenders, pillars, frame members, engine compartments and cavernous undercarriage areas where the Rusties love to hide out. 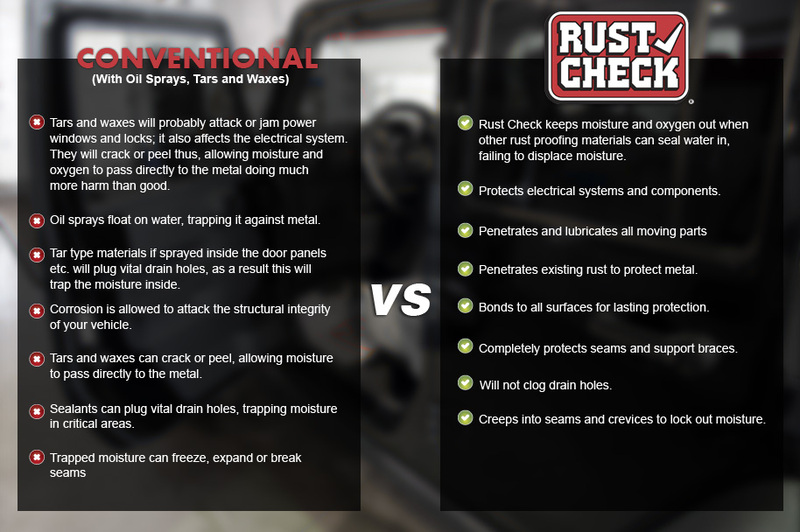 Rust Check is time tested and proven for over 40 years. Rust Check is not only for new vehicles. Even older vehicles and those treated with other inadequate rust coatings can benefit from the deep penetrating action of Rust Check. Rust Check will not repair damage already done to older vehicles but it will inhibit the progression of rust in problem areas. Rust Check has been accredited by Millions of satisfied customers this is the most compelling evidence that Rust Check really works.